Silence is Prayer, Prayer is Faith, Faith is Love Love is Service, The Fruit of Service is Peace"
Watch the Mass on your computer streamed live from Mary, Mother of Mercy Church at Burleigh Waters. Be a part of the celebrations even if you cannot be physically present. Videos of previous masses are also available to watch on your computer at your leisure. Welcome to the website of the Catholic Parish of Burleigh Heads on the Gold Coast. This site contains information about our five churches and their locations, our schools and various activities associated with the rich community lifestyle of our parish. 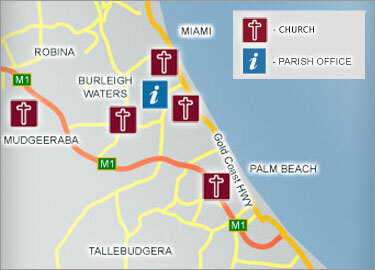 Our five Catholic Churches are located on the southern end of the Gold Coast at Burleigh Heads, Burleigh Waters, Miami, Mudgeeraba and Palm Beach. Each church community is active and welcoming, and strives to celebrate liturgy and life with vitality and reverence. Each community if blessed with diversity among its members. The elderly and the young, the retired and the working family, the regular visitors and the holiday makers all form the rich cultural diversity of our catholic parish. We are a parish within the Roman Catholic Archdiocese of Brisbane. Priests of the archdiocese lead us in our search for and in the expression of our faith, and minister the various needs of individuals and communities. To find a Church near you, click on the map above for full address and directions.